The Colosseum in Rome. Angkor Wat in Cambodia. Chichen Itza in Mexico. Some sites around the world were absolutely amazing to see in person no matter how many times I’d seen pictures of them or how much I’d built them up in my head. However, the Terracotta Warriors in Xi’an, China, definitely do not fall into this category. In fact, I don’t think that it’s a stretch to call them the most disappointing and overrated tourist attraction in the world. I realize that many of you must think that I’m crazy. It’s very possible that you have been there and thought that the Warriors were amazing. Or maybe, they are near the top of your “must-see” list, and you can’t imagine being anything but wowed. And honestly, a year ago, I would have been right there with you; I went into the Terracotta Warrior experience expecting nothing but great things. I mean, how couldn’t you? The sight of thousands of stone warriors made over two thousand years ago should inspire a real sense of awe; shouldn’t it? We’ve all seen the pictures. The thing is, it just doesn’t. At least not for me. After mulling it over in my head for the last six months, and letting the initial disappointment fade, I feel like I have figured out several reasons why Xi’an’s Terracotta Warriors are the most disappointing tourist attraction in the world. At first glance, this might seem like a weird thing to say. After all, you are staring at thousands of statues built a really, really long time ago. However, when you visit the Warriors, they require the very large crowds to stand back a decent distance and look down on the Terracotta Warriors. Of course, this certainly isn’t the fault of the planners, I mean, you can’t just go stand next to them; I’m sure they are quite fragile. Despite their large numbers, there is just something about the Terracotta Warriors that doesn’t excite. Unfortunately, though, this setup takes away from the grandeur of the statues. When you go to see Angkor Wat, the Pyramids, or other great structures, you are often amazed by them because they tower over you. You can go and stand next to them, touch them even. You can really get a great feel for the beauty of these ancient wonders. However, standing so far back from the warriors and looking down on them really makes appreciating them difficult. It’s sort of like seeing a celebrity and realizing that they are really short in real life. Don’t get me wrong, I’m not saying that the Terracotta Warriors are fake (though some people do). I just feel like the display that we are shown today is not a true representation of what has really been found. When you visit the largest pit on the site, you are greeted by thousands of intact Terracotta Warriors standing at attention in large formations. However, everywhere else you look there are simply fragments of warriors sitting in the unexcavated dirt. It seems hard to believe that they excavated so many complete, or almost complete warriors, in one area of the pit, when all the ones still in the ground aren’t intact. The statues you see are real ones from all over the site that have been moved to their current location for effect. Most or all of the statues were found in pieces and reconstructed to appear whole. Most or all of the statues displayed are modern reproductions of the ancient warriors. If numbers 1 or 2 are correct, it doesn’t really bother me. I just think that they should be forthright with the information. An honest statement about the reconstruction wouldn’t detract much from the potential impressiveness of the site. I mean, the things are over 2,000 years old. One of the Terracotta Warriors on display for closer inspection. On the other hand, there is the third statement. Now, before you just immediately think that I’m some crazy conspiracy theorist, there is one very important point to consider: The only archeologist to ever examine the Terracotta Warriors on location have been approved by the Communist Chinese government. No foreign archeologists have ever examined the Warriors that are in the pit. Why the secrecy if everything is legit? 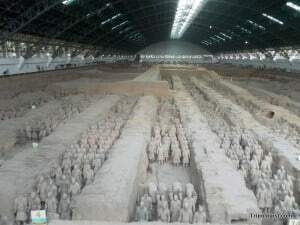 Is it possible that few intact ones that they found are in various museums around the world, and the ones that we see in Xi’an are mostly reproductions? As the story goes, a group of farmers were digging a well in 1974 and happened upon one of the (if not the) most amazing archeological discoveries of the 20th century. I’m not going to lie, I don’t have much faith in governments, especially communist ones. However, it just seems a bit to convenient to me that the Terracotta Warriors were found by common farmers just as China was starting to open up to the western world. The Chinese government would have a lot of incentive to mislead us as to who found them and when. Now, that of course, really has nothing directly to do with whether the warriors are legit, or even whether or not they are impressive. However, the pattern of questionable feelings that I received at the site reinforced to me that the warriors were just not nearly as impressive as they should be. In fact, I honestly believe that, real or not, the Terracotta Warriors are the most disappointing tourist attraction in the world. But, what do you think? Have you been to the warriors and think that I’ve finally lost it, or do you agree with my feelings about the Terracotta Warriors? Let me know by commenting below. Find somewhere great to stay in Xi’an, China! I lived in xi’an for 2 years. I’ve been there and of course seen many people come and go. I can’t believe I’ve never heard anyone question their authenticity before. EVERYTHING in China is fake. Why not the warriors? I was impressed when I visited but they are overrated. Interesting theory! I’m not questioning the authenticity of the Terracotta Warriors; I believe that they existed. I’m just questioning whether what we see today is a modern reproduction of what it used to be like. Glad I’m not the only one who thinks that they are overrated. If you get a guide they explain openly that they have been restored to show what they would have looked like. It’s no secret – in fact there is a lot of information in English in the museum itself about the restoration process. They are more than open about it. However, whether or not the whole thing is a scam is another question – and I don’t know if I trust the Chinese government to tell the truth. YES! I was completely underwhelmed after visiting! Everybody I tell doesn’t get it or loved it. It was the most disappointing attraction ever. At the moment there’s an exhibition of 150 replicas of the terracotta army in Brussels. At first I wanted to go, but then I thought it wouldn’t be worth it. And as you’ve seen the supposedly real thing and were disappointed, maybe it’s a good thing I didn’t go yet. What bothers me most isnt that the statues might have been replaced, reconstructed or even that they might be replicas. It’s the lack of clarity and explanation. Man, I couldn’t disagree more! My wife and I found them to be one of the most impressive things we’ve ever seen (behind the Moai of Easter Island and Mount Everest). I have never heard the idea of them being fake though… interesting. I’m sure you saw the exhibit where they’re rebuilding them; from that I assumed that #2 was the explanation for all the reconstructed ones. Interesting read and to each his own. Some of the statues have been in museums and what not, and I’m not questioning the authenticity of those. I’m sure that they found a few that were completely or mostly intact. I just don’t think that they have found thousands of intact ones all standing in nice neat rows. Yes, to each their own. I personally was very impressed and wowed at the site of the warriors. They were one of the highlights after traveling through China for 4 weeks. I was impressed with the size of the army and the amount of work that would have gone into making them…just to be buried underground. Now, if you’re going in questioning their authenticity, then of course it would be underwhelming. Many of the historical sites in the world have undergone restoration and even reconstruction. It’s not about trying to make them appear as if they’ve stood the test of time, but rather a chance to showcase them as they once were. You are right, many sites around the world have undergone restoration at one point or another. I don’t even have a problem if that is the case with the warriors. However, when they aren’t forthright about the restoration, I have a problem with that. It is their reluctance to admit to the restoration and the lack of independent inspection that makes you wonder what they are hiding. Thanks for posting a link to your article. It was interesting reading a different opinion. Isn’t it interesting how two people can go to the same site and get such opposing opinions? As you said, “to each his own”. I went when I was 16 and to this day my memory is of the man standing there to be sure we don’t take pictures giving me a dirty look when I did take pictures but not actually doing anything–I don’t remember the warriors too much! When I saw the Terra Cotta Warriors with my daughters in 2003, we were a bit underwhelmed. We felt that there was more empty space than space with soldiers. However, Xian the city wowed us. Great post…Lots to think about. So, China has a bunch of theme parks with replicas of world-famous attractions (from within and outside of China). 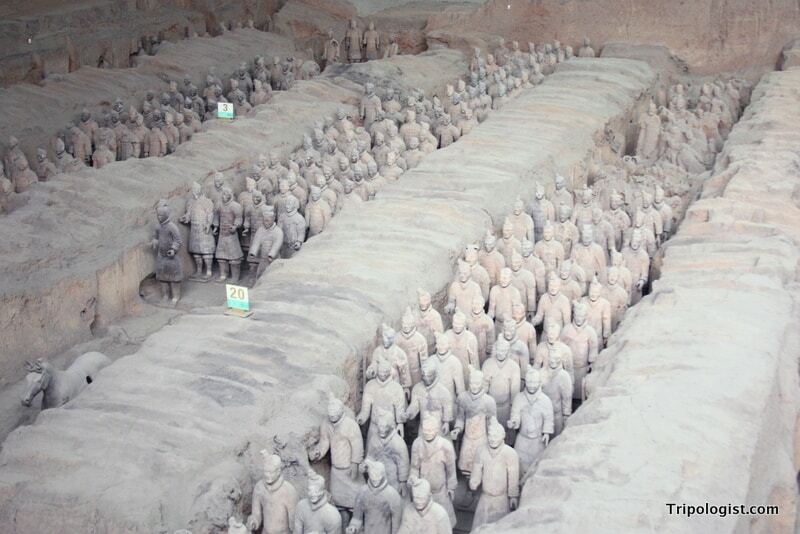 Basically, the US should construct a bunch of terracotta warriors à la Xi’an because it would be the same thing? Meh, at least Xi’an has 肉夹馍. On the other hand, do you know how many Noah’s Arks there are in the US? Hong Kong has one. Having a few screws loose is contagious, no? Have to comment again on this because all the speculation about the veracity of the soldiers makes people sound pretty ignorant as if they’ve not done their own due diligence. Having a background in Art History I’ve read/ studied these pieces; all I’m saying is that the information is readily available out there. When I finally visited this site in person, there was nothing obscuring the fact that these VERY old CERAMIC (read: fragile) pieces were mostly destroyed when the roof designed to cover them collapsed under the weight of accumulated earth on top. That means all the soldiers were damanged or broken in some way. Besides that, over the hundreds of years that passed, other generations did not respect these as valuable works of art simply because they didn’t know what they were. So the farmers and country folk used to burn fires right in top of the wooden roof built to shelter the soldiers, among other activities that we would today consider disrespectful. That’s why you can see black scars in some places. In any case, not sure how much you know about the painstakingly tedious process of archeology, but piecing together a bunch of broken ceramic bits takes a long time! I will give you credit for speculating what’s up, why are the archeologists taking so long. It seems like they’ve had enough time to scrape together a bigger team by now, but perhaps it’s a budget issue that is restraining. I’d like to think that in the US they’d get moving faster on the restoration, but then again I’ve seen enough National parks with budget cuts to explain and I don’t want to be egotistical enough to project my Western perception of the importance of speed and efficiency onto their (slow) reconstruction process. Perhaps you are not aware that there is a full-time team of 13 Chinese archeologists working on this project daily. It takes a loooong to piece together about a zillion broken ceramic bits! Indeed, all the soldiers you have seen on display have been restored in some way. I didn’t experience any obscuring of this fact while I was there. Perhaps it’s just a misunderstanding of the process of archeologogy and art restoration. In fact, most UNESCO historical sites like this fail to explicitly describe the excavation and restoration process. So perhaps that’s what some of you are really taking issue with. Wow! Thanks for taking the time to write such a detailed comment and leaving the links below. As I stated, I’m not suggesting that the warriors are made up, and I do understand that many comparable sites aren’t always 100% straight-forward with how much restoration has been done. However, I feel like they go out of their way to make you believe that the statues were found whole. As with many articles about newly found warriors, they give you the distinct impression that they were found completely intact. Clearly, that’s not the case, as I think we both would agree. I just feel that they go out of their way to give you that impression. Either way, even if they were all found whole, there was just something about the Warriors that I found underwhelming. At the site, they claim that the colorful paint which originally covered the soldiers was eroded away by the elements with the initial opening of the pit. There are no signs that I saw saying anything resembling, “These soldiers were mostly broken to bits and reconstructed,” or, “This is a reconstruction of the original tomb,” or, “We’ve arranged these figurines in rows as they originally were.” Instead, they would have you believe that the pits were dug up and the soldiers were found just as they are, and that the only damage to them was the loss of paint. Also, most of the soldiers don’t look pieced together, but smooth and perfect. In my opinion, the team of archaeologists they have working round the clock also looks shoddy. It’s a poorly executed attempt to convince people that scientists are studying this carefully, so it must be legit. I recently visited the terracotta warriors and was very disappointed, everything looked like it had been created by some disney imagineer. I really disagree, I think the warriors are an amazing sight. A pit seems the right place for them to be as they are part of a burial! The individual statues are themselves beautiful, especially the archer which seems to be everyone’s favourite. Maybe it helped for us that when I and my husband visited there was no-one else there. Most underwhelming: Chichen Itza – can’t hold a candle to many other Mayan sites such as Tikal, Copan and particularly Calakmul, buried deep in atmospheric jungle and rising high above the jungle canopy. To each his own on the warriors, I suppose. I don’t disagree that they should be in a pit, I just think it makes them less grandiose when you have to look down at them. As for Chichen Itza, I really enjoyed it, but I’ve yet to visit any other the other sites you mentioned. Also, I was there when you could still climb it, which made it infinitely more awesome! I’m with you Jim, something about these warriors just does not seem real or genuine. I visited them in July 2012 and was very disappointed with the experience. The whole environment left me with the feeling that it is all staged and just a big money making effort to grab some dollars now that china is open to tourism from the west! I visited in July 2012 as well. Maybe they were just having a bad month? I visited in July 2011, and it reeked like BS back then too. As the warriors are the main reason to visit Xian I would suggest people give the whole province a miss. They really are not impressive in person and the city in my experience is full of scams and rip off tours. Of course, all cities in the world (not just China) have their share of similar rip off tours but my experience in Xian is that it is typically much more widespread here (difficult to find a decent tour in fact and I suggest you take the bus and walk the site alone). I am not sure what people find impressive about the site itself. OK the history of the statues if correct is interesting (it is not clear to me that the story has enough archaeological evidence to back it up but this is probably true all over the place so just go with it). The individual statues are pretty cool to look at. But the site just has nothing to offer that you cannot get from internet research (unless you want to say you have been there). The one point I was told from my tour guide who was almost otherwise useless is that there was only one statue (a kneeling archer in pit 3) that was found intact. ALL OTHERS are restorations (at least). Beware of the “farmer” signature scam also. Do not fall for it (despite how “lucky” you are that he is available at that very moment). Thanks for the comment. You’re definitely right about the city not really being worth it. While it isn’t completely without merit, the number of scams and hassles makes Xi’an worth skipping in my opinion. While I can’t speak for the tours being bad (I just went on my own with the public bus), I can imagine it would be hard to find a good one. As for the farmers, I saw them there too. I think there were at least 3 when I was there. Pretty sure they have them there everyday. Doubt they’re the real guys anyway. Thank you for writing this very honest article. It provides a lot of food for thought, as I am trying to decide whether or not to include a day trip to Xi’an in my China itinerary. Amazing how this attraction incites such strong feelings! Thanks for the comment, Katherine. If the Warriors are at the top of your bucket list, I say it’s worth going and deciding for yourself. However, if you don’t have much interest in them, I’d give it a pass and spend that time somewhere else in China. I’ve written about several great Chinese destinations if you look through the archives. 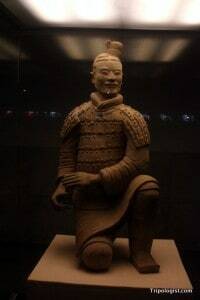 I have to say for Xi’an Terracotta Warrior, Chinese people said to me same as you point out the post. They said it made me disappoint when I had visit inside the place. This is from Chinese speaking not Thai of my citizen. For me in China, Xinjiang is the most place you must visit. The 2nd place is old town of Beijing, it’s very fantastic. 北京欢迎你, 嗯嗯. hahaha. The reason why they do not allow foreign archaelogists is well…um…. THANK THE EUROPEANS WHO STOLE ARTIFACTS FROM CHINA in the past to put it in their museums. I can see why China does not allow foreigners near their national treasures and rightly so! I visited the warriors earlier this month and was also left unimpressed. I would have been impressed if the statues had remained intact since their construction. Anybody can glue back together a whole bunch of ceramic pieces. Also if you have not seen them in person, the picturesque view of the warriors in the main pit is quite deceptive. In reality only the front third of the pit contains reconstructed warriors, I was told there are approximately 2000 fully assembled warriors and there is believed to be a total of 6000, the remaining 4000 are either still buried or being pieced back together. I completely agree! Saw the warriors two days ago. I actually just wrote a post about how I am disappointed with Xi’an as a whole. The warriors have brought in so many tourists, that the entire Xi’an has been updated to bring in more money. Not to mention the ridiculously high entrance fees. Definitely not impressed. What happened to the history in this city? Now everything is just for show. And SO many replicas!!! I definitely agree about Xi’an. I spent 6 weeks in China and visited 9 different cities. Xi’an was far and away my least favorite city. That being said, there are some nice little temples in the Old City if you get away from the super touristy areas. I have just come home from china where I visited the Xiang wonder of the world or not. Thing is I asked our chinese guide were there any video evidence of the expiration his sheepess reply was NO funny that as the pyramids had cini film in the 30s . In conclusion I was really disappointed or should I have been when I was in the land of fake goods? I went during the national holiday week during october, so of course half of China (it felt like at least) was also there when I went. The warriors are incredible but the management of the site could be done a lot better. We visited in September of 2010 and completely disagree with you. I’m glad you enjoyed your visit, Nick. That’s the thing about travel, what one person likes someone else may hate. Just a matter of perspective. I am a native to Xi’an and I could not disagree with you more. Your comment just sounds extremely self righteous. I can see what you mean by lack of explanation, but this isn’t disney land; it’s not the attraction’s job to do the research for you, they just show you what they have, it’s entirely up to you to read up as much or as little on the subject as you want. I have been to many amazing Sui dynasty Buddhist temples in smaller cities in Shaanxi and some of them don’t even have legible signs in Chinese. Those low key places are the best, as regular tourists don’t know about them (or understand them) and they have the least amount of preservation done. The more an attraction tries to explain something to you the worse, as it just becomes diluted a mainstream pop culture tourism wannabe. Your perception of what information should be readily available at a historic site of this magnitude is completely flawed. Of course everyone wants the details!! If you leave the details out, people like myself will doubt the legitimacy of the whole thing. I was told when I visited that the TWs in the pit were all fakes and that no true TWs are there at all. That they were all broken and then put back together as best they could. I know when I heard it was bummed that I was looking at reproductions. It doesn’t diminish the task it took to build originals but it does take the shine off the apple. Infact my guide told me that there are NO TWs that are completely intact that everyone found was broken. I’ve been to Xi’an twice, and both times, I went to see the Terracotta Warriors. The first time, we went into the gift shop and met Yang Zhifa, the guy who apparently found them. Several years later, when I returned to Xi’an, we went into the same gift shop, and Yang was there again. Only this “Yang” was not the same guy as the first Yang we met. He said that he was the farmer who found the Terracotta Warriors, but that’s exactly what the Yang before him said. Keep in mind that this was several years later, and the guy that claimed to be Yang hadn’t seemed to age at all. Interesting story, Ling. While there were multiple farmers who found the warriors, that certainly is a bit questionable. So the article is saying they are not that impressive because the Chinese have tried to make them seem more impressive by hiding the true story as to the actual impressiveness of the soldiers. What a load of twaddle. No, I’m saying they aren’t impressive because they aren’t that impressive to look at. The fact that the story is questionable and there is little information about them at the actual pits just makes it a bit worse. I lived in China 10 years and have been to Xi’an multiple times. I have never believed that the warriors were real for several reasons. Firstly, seeing how many of the replicas, that are exactly like the “restored” ones at the site, are sold and splashed around as decor in many decadent Chinese homes makes one skeptical. Secondly, I was told at the site on more than one occasion in Chinese and English that there were three farmers who found the warriors and each time I visited I was introduced to the last surviving farmer. However, each time I went, I met a different farmer who was reportedly the last surviving farmer with the same surname, charging an absorbent amount for his autograph in a book about the warriors. Thirdly, I watched the spectacle grow from an insignificant attraction that heralded very few tourists some 12 years ago to the multi-million dollar attraction that it is today. Fourthly, the Chinese government has everything to gain by promoting these pieces of clay. That’s why they hired Zhang Yi Mou, China’s most successful movie director, to make the 360 degree animated movie as part of the attraction. Who ever compared the warrior attraction to Disney isn’t being fair. Disney has never purported its characters to be real. One commenter thinks that the Chinese government won’t let outsiders verify the authenticity for fear of being stolen. If that were the case, the warriors wouldn’t be toured around the world adding even more money to the attraction’s coffers! So, the question remains: Why won’t the Chinese government let outside experts verify their claims? My guess is for the same reasons that brothels exist next door to the police departments and the factories continue to produce knock-offs: lies, deceit and corruption abound at every level in China despite the current events that try to show differently. Fot all the history behind the terracotta warriors, all you can say was it was built more than 2000 years ago. Watching PBS show on Warriors and found your post. Went last year and was with a bunch of skeptics (including a Chinese national) so that made the trip interesting. Our Chinese friend just kept repeating that nobody knows if the Emperor had them made or not. I’m glad I went and enjoyed sleuthing the history. Xian was fun. I say go see for yourself. We witnessed a local man run into one of the pits with his kid only to be hauled away by the cops. I just came back from China and wanted to research the Terracotta Warriors because my first impression of it was that it was fake. I felt like I was in an amusement attraction and the Warriors were all replicas. The movie that was shown was a joke. Where are videos of researchers and scientists? Instead they provided a stupid film. I felt disappointed and cheated by the whole experience. They found items and burial site exactly matching to historical records written 2200 years ago, and plenty of foreign archeologist have studied the material and determined it’s age. You just lack imagination, if you can only see that the sculptures as real life replica and representation of an army 2200 years ago only known through historical texts with it’s battle formations, and each individual army with authentic weapons, and authentic replica armor, and all of a sudden a grand archeological find that confirmed everything you read from those texts to be true, you will be astounded. Which other archeological sites have capture a grand piece of history like this? They recently just unearthed another pit with an additional 1200 soldiers, the largest pit have yet to be excavated, according to historical text, and there’s little reason to doubt it’s veracity anymore, almost everything written in those text have been corroborated with archeological findings, that includes the recent discovery of an almost intact crossbow that is as powerful as it’s modern day equivalent and it was described in historical text as having a maximum range of 2200 meters, well the archeological find proves that it could in fact exceed the 2200 meters range described in those ancient texts, those crossbows were not only authentic they were 2000 years ahead of their times. That’s because they’re building it according to the ancient writings. Duh! That way they can point to the writings as proof of authenticity. Why hasn’t that main tomb been excavated yet? They’ve had like 40 years to begin excavation and I just don’t buy the excuse that it’s “too dangerous due to booby traps,” or that they are going to wait another 40 years because they want better technology to preserve artifacts. ‘Come on man! I’m not buying that story and I think they are still constructing/designing the main tomb, and the completion deadline is still 35 years out. Once China has had enough time to collect enough mercury to construct the “100 rivers of mercury” for the main tomb, the tomb will be excavated. Just returned from China. Went digging for some more info are visiting the warriors and leaving feeling ever so sceptical about the site. Glad to. Come across your blog and the comments which shed more light on the topic. After visiting Guilin (where every attraction was reconstructed complete with neon lights to the delight of hundreds of domestic tourists) the warriors sparked many questions! Guilin itself was definitely a bit disappointing as well. However, I visited the nearby XingPing and it really had a great feeling of authenticity. I also really enjoyed my trip into the countryside of Yongshou. Once you get out of the touristy area, it’s really an amazing place. A little bit of research, or indeed reading the signs at the Terracotta Warriors soon make it clear that they have been reconstructed per say. That hardly makes them fake in my book – they appear to be faithful to what was originally there, and to me it is still astounding that such a thing was made more than 2,000 years ago. Some people just read too much into things – use your imagination and enjoy life – be skeptical where there is obvious reasons to do so, but I don’t think it takes too much imagination or a bit of reasoned thinking to understand why it is truly a remarkable find. As for the farmers that a few have raised – why is anyone surprised that they are fake? Its well know its one of a many a tourist scam going round in China – to actually think its the real farmer that found them shows just how gullible some people are. One thing from any travel in china should tell you, is they are willing to go to extraordinary lengths to empty your pockets. Totally the opposite for me, I was really blown away by the number and size of the terracota warriors and I think Chichen Itza is overrated… I think the term ‘new wonder of the world’ is too much for this, I think it’s just because it’s very accessible for the mass tourism from Cancun. I just came across this while looking for resources to share with my students, and simply cannot believe it (I might actually still give them this so they can pick it apart further). The stance of this article, which you are free to take, is simply unfounded by the facts of the actual location and I want to protect the site from you and your commentary for other readers. Did you truly visit? Did you look at more than pit 1? You do not even appear to have read any of the English signage around the pit. How about the Circle Vision movie which explains things you may have chosen to not read (that is, if 20 minutes is not too long of a taxation on your time)? I have been there several times over the course of many years. The English signs state clearly that the artifacts have been reconstructed using found and restored pieces, crafted pieces to preserve the quality of display for those in the collections, and those that are on the platform are still being restored. Due to opposing forces having found the burial site of Qin Shi Huangdi, and the army clearly not being alive, they were smashed and burned, resulting in the damage and burned timbers that you see. The lumpy variegation that you see along the top, is the timber roof still preserved. The reason that they are “in formation” is so that we see what was intended by Qin Shi Huangdi, a formidable army to protect the Qin emperor in his death. Additionally, besides being presented like a “museum collection”, their placement allows for additional excavation in the pit. Additionally, the statues were created of clay and covered in lacquer before being painted. Since the site was damaged many years ago, and the lacquer exposed to excess ground moisture, when the statues were unburied, they were further damaged, the lacquer dried out and the paint flaked away to dust. Museum science, however far it has come, is still evolving around the globe. You state that China does not allow foreign archaeologists to examine the warriors of the pit, however, that is untrue. They have teamed up with other archaeologists around the globe to help preserve the painted statues before they can be destroyed from air exposure, which can occur within minutes. In particular, a team from Germany and another from the UK have been allowed in the pit, and allowed to run tests. The German team, was also one of the leads on a test of using a plastic coating to possibly preserve the artifacts (but given the porous nature of the elements, I personally think they should be consulting with a paleontological archivist). Therefore, postulates one and two are both correct. Firstly, the statues have of course been moved to a safe place for reconstruction since only one out of nearly 6,000 so far in pit one has been found nearly complete and they needed to be repaired. I am sure you would find a pile of rubble, even at eye level and able to be touched, far more underwhelming than what is there today. Secondly, yes, they have been reconstructed. Are you aware of how museum collections work? Unless the items are in pristine condition and preserved at that point in a way that they will always remain in pristine condition, they will suffer damage and need to be restored. It is called preservation and restoration and has been done to Chichen Itza, Angor Wat, and all of the other sites you did find impressive. It has even been deemed tolerable, without detracting from the aesthetic value for priceless paintings like the Mona Lisa and the Sistine Chapel. As for your questioning of whether the farmer found the statues, maybe, take a ride out the site. The first time I went, I traveled as the regular Chinese tourists do, public bus. It leaves from just past the train station. Take a look at the scenery, it is mostly farms. There is nothing in the area of the museum that would have brought construction that warranted finding anything there. Unless, the whole thing is faked! Maybe the government put the fragments in the ground, too! Oh! Wait, taphonomy would explain that one away. Maybe learn Chinese and actually speak to the farmer! That won’t work though, he is probably dead since you question the timing of the discovery… Oh wait! No, he isn’t and actually, he is a regular visitor that tourists can speak to (if they can). Now, I would think that going through all of that effort to find an actor to learn the story is just insane. Judging by your statements here, you should probably stay away from the Great Wall, you might want to rename it the “Underwhelming Wall of China,” the “Mediocre Wall of China,” or how about “There-Were-Too-Many-Stairs-And-Nothing-Much-To-See Wall of China”. You would likely just ignore the fact that it is filled with history, both ancient, and modern. That it is an engineering wonder that predates the Qin Dynasty. The numerous military advantages that it presented multiple dynasties with. All lost facts to someone who would likely just see a large, grey, brick wall in the middle of no-where. Hell, they might have faked that, too! You know what? They probably did. Stairs thousands of years old just wouldn’t hold up, and if they actually did, why do they let you walk on it. Oh! Right! Restoration… You might just get disappointed since you really cannot see it from space. Maybe next time, stay home and read a book about a place instead of going there, at least that way you will learn something! I did visit the Terracotta Warriors. Just my personal opinion. As for the Great Wall of China…I loved it! Jim, my wife and I will be visiting Xian in Sept., and as independent travelers I google to find information about Xian, and came across your post.I do not understand the objective of someone posting such a negative (and offensive,in my view) article. re a world renowned historical site, what were your objective? The previous post stated that the English signs clearly states that the warriors were reconstructed and you did not dispute that, so what were your objective when the first part of your post made such a big deal about your doubt that the warriors were a “true representation of what was really found”? You go on and on about the Terracotta Warriors is the “world’s most disappointing tourist attraction” and yet in the same breath you declare that you “love” the Great Wall. How is the Great Wall different? Is it not also a reconstruction? Does it not come with tacky souvenir stalls, handrails and even cable car access! but the wonder and delight is all about the historical context. After all, what is so great about staring at a pile of dinosaur bones (also a reconstruction) other than the historical fact that such animals existed millions of years ago. Personally, I find moldy cheese disgusting, but I do not feel the urge to declare this to the world and offend the many many people who love moldy cheese! There is a universal saying, “if one does not have anything nice to say (in public), perhaps it is better to say nothing at all”. I feel the warriors themselves weren’t disappointing but the experience itself was a little underwhelming. Constantly being barged out of the way by huge tour groups got a little tiresome after a while. I mean, it’s to be expected at such a popular tourist destination, but it did grate a bit. No complaints about the statues themselves though! WTF. I’m here now and they are amazing. Quite an interesting take here: I haven’t seen the terracotta warriors (or been to China) but am planning to do so next year in 2019. My knowledge of China’s history and art is very very poor. But something’s bothering me here : I have been raised in a family that was well versed in archeology (my father and older sister both Studied Art History & Archeology at the University), and I spent a lot of my childhood and teenage years visiting ancient sites in Italy, Greece and Egypt. It seems that it’s a long-going debate among archeologists whether ancient architecture and art should be reconstructed for visitors and, if so, how : should the rebuilt parts be made quite visually different than the original ones, or should they blend in? I understand arguments from both sides and would choose the middle way : make it apparent from close by or paying attention, but make them blend in at first sight. I frankly think that, without some degree of reconstruction – and, yes, with the inauthenticity that goes with it – most ancient sites wouldn’t be appealing to anyone but die-hard archeologists. One of my favorite places in the world is Karnak Great Hypostyle Hall : I was so overwhelmed during my first visits at ages 8 and 14. But now I see that most – if not all – columns are rebuilt to some extent. It’s even more obvious for Hatshepsut’s temple at Deir-el-Bahri. But it doesn’t change my love for these places: what matters most is the overall effect, and the possibility to study and admire the original parts. * on one hand, indeed, preventing people from admiring ancient art from nearby – with its original imperfections and the imperfections of its reconstructions – is not cool. Moreover, if the overall impression does matter, clearly in your case the exhibitors’ goal was not reached (even if it may be highly subjective). * on the other hand, it doesn’t seem fair to me to hold other, non-Western, civilisations (and, yes, tourist industries) to different standards than the ones we apply to, say, Greek or Egyptian temples. Of course, when you compare pictures from recently excavated sites (even at Thera/Santorini or Pompeii) to the same sites as visited by tourists 20 or 50 years later, there’s a Disneyland-ish feeling to the latter. But we should accept it or condemn it uniformly. Have just recently visited and I feel the place is amazing. They have made no effort to hide the fact that the warriors have had to be pieced back together and if you actually look hard enough you can see the parts that were still missing from them. They clearly state that they have only found once statue in one piece which was a kneeling archer. Why do you think it takes so long to add to the collection. Some of the statues have taken over a year to put back together. They also do not work on them over the winter months. You either didn’t have anyone there to explain how it works or bothered to take the time to read the information provided.